So whilst doing my usual internet browsing, blog reading and instagram stalking I stumbled across a brand which I fell completely and utterly in love with. Being a blogger, writing down things is an everyday occurrence. I am constantly jotting down to-do lists and ideas for both my blog and my everyday life! I think all bloggers/bloggers can relate to this! I'm all about owning cute stationary and notebooks and I feel like with Chroma Stationary I've found a brand I can use over and over again! That's right, this brand is everything I have been looking for, a place to get a totally personalised but still gorgeously pretty notebook! You can pick the type of notebook, the colour of the notebook, either blank or lined pages PLUS you can have whatever you like embossed onto the front! I had seen some gorgeous examples from other bloggers and was so super excited to be able to design my very own! Because my blog logo is so light and doesn't have a lot of bold writing it was too difficult to get in embossed so I was left with a desicion which took me a long, long while..... What on earth do I want written on this thing!?! 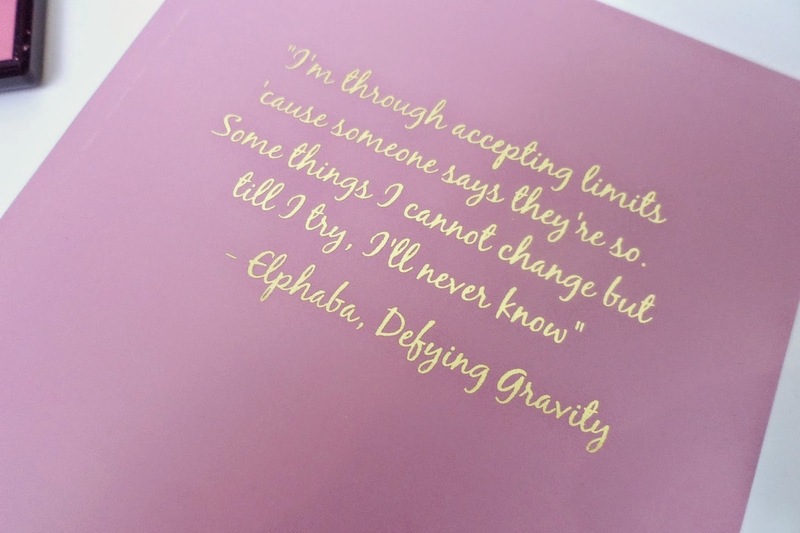 I spent a lot of time umming and arring over it (this was a tough choice for me I'm not going to lie..... #firstworldproblems) but i finally decided to go with a quote/lyrics from one of my favourite songs ever - Defying Gravity. I think most of you know I'm a HUGE Wicked fan and I love this song and the meaning behind these words! So this is the finished product - and I LOVE it, I did a little squeal of excitement when I opened it! This is the bound notebook in the shade 'Elizabeth' with blank pages and gold embossing. I didn't choose the font or placing of the writing but I think it is perfect! The notebook is slim and compact so it is perfect for popping into my everyday handbag which is great as it means I have have it wherever I go! I'm also thinking I might do some cute mood board type pages in there too - magazine clippings and a prit-stick is always fun - I love unleashing my creative side! I can see me ordering more and more of these - I have so many great embossing ideas, and they would make gorgeous personalised presents for friends and family! Thanks again to the lovely Gabi from Chroma Stationary who was fabulous from the very beginning of the process - I am overjoyed with the finished product!! 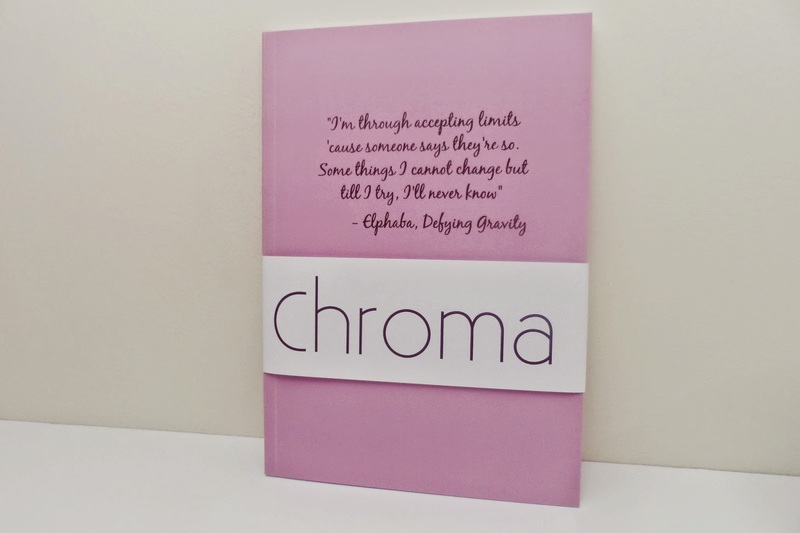 Check our Chroma Stationary and get your own notebook - here. Best quote ever, such a wicked fan :) gorgeous notebook! Yup.. All bloggers can relate to this.. Jotting down any random thoughts that come up in our mind and then weaving them together into something sensible for the world to read! I know I love writing things down and I loved it before but it increased when I became a blogger. I need one in my life and since I've been looking for a pretty customized notebook this might be it. I would probably not know what to pick too. Oh this looks amazing! I'm a stationery lover, so a personalised notebook seems even better. This is super cute. Such a great quote to have on the front of it.